Do you enjoy old school 70s style anime? Do you enjoy shooting down hordes of enemies with a giant mecha robot? Do you enjoy a good challenge? Astro Port and Nyu Media offer Supercharged Robot VULKAISER on Steam to satisfy all your needs. 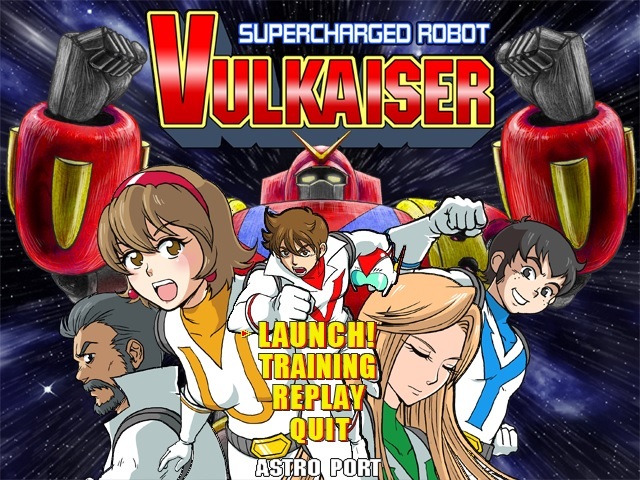 Supercharged Robot VULKAISER is a homage to the early days of anime. The Gogoh Army, led by Roz, has arrived to invade the Earth as part of a galactic conquest for the Gogoh Empire. It is up to the crew of the Supercharged Robot VULKAISER to stop the Gogoh Army and restore peace to Earth. The Gogoh Army has many threats up its sleeve. 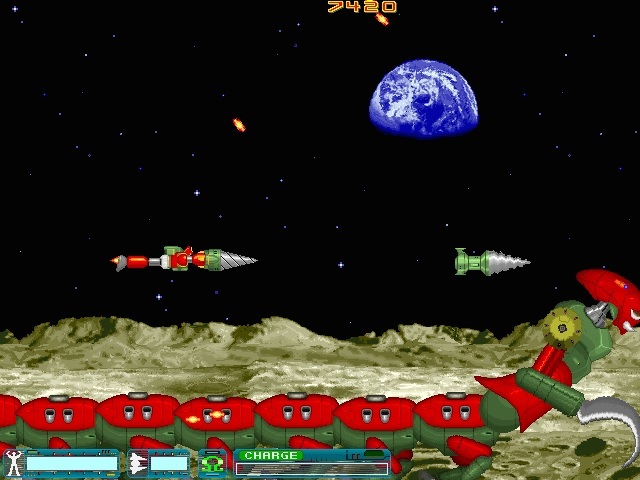 Supercharged Robot VULKAISER is a horizontal side-scrolling shooter. The goal is to get through each level and reach the boss at the end. Each level is presented as a anime episode. The game is very basic in its presentation, yet faithful to the animation of the time. All the characters and levels look hand drawn. Takuya Akatsuki is the hero and pilot of the legendary Vulkaiser. It is up to him and his four comrades to combine and survive the onslaught of enemies. There are two options for the game, Launch! and Training. The latter allows players to pick a level and choose to train with a particular combination of weapons or can choose no combination of weapons. The main game is found in the Launch! option. 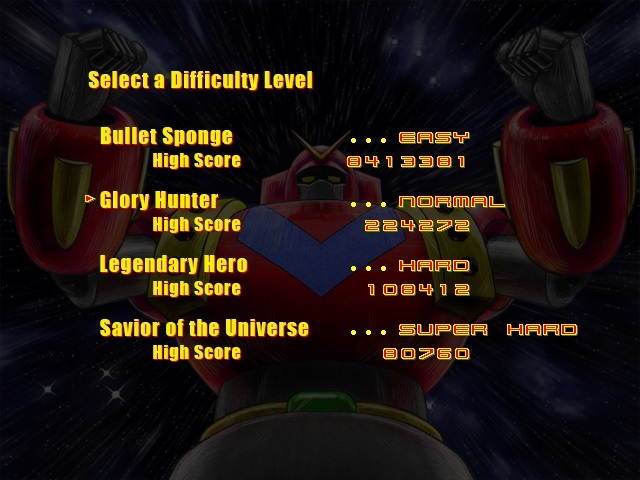 The game has four difficulty levels: Easy, Normal, Hard, and Very Hard. Easy is a great option for players who want to enjoy the story of the game and have a simple time with the game. The remaining difficulties will challenge the player. The harder difficulties will increase the number of enemies, the number of projectiles, and the enemies will have more aggressive attack formations and patterns. Completing each level with a specific character will reveal their backstory and give you some tips. The game itself is only five levels long, but, in exchange, the game only grants players one life during each run. Once your health is gone, it’s game over and back to square one. Players can use either the keyboard or the controller to shoot and maneuver the Vulkaiser. The Vulkaiser has a small hit box — as long as no projectiles smack into the hit box, it will not be harmed. Both the arrow keys and the D-pad were responsive. The Vulkaiser in its base form is able to shoot bullets from his arms. By rapidly firing bullets against enemies, a charge meter will fill up. Letting go of the charge will release the arms towards the enemy like a homing weapon. Throughout each level, there will be an opportunity to combine the Vulkaiser with one of four Vulfighters: rocket, needle, lighting, or drill. Only one can be combined at a time. The Vulfighters give the Vulkaiser additional firepower against enemies. Like the Vulkaiser, they have a special charge weapon. Each Vulfighter has one Omega weapon. The Omega weapons are useful to get out of a bad situation against either the boss or a swarm of enemies, but it can only be used once per level. My favorite Vulfighter to use is the Drill. Unleashing the charge causes a homing drill to attack enemies in front of it. It’s also a great quick front shield against swarms of enemies. At certain points during the game, you have the option to either keep the current Vulfighter equipped or switch to a new one. 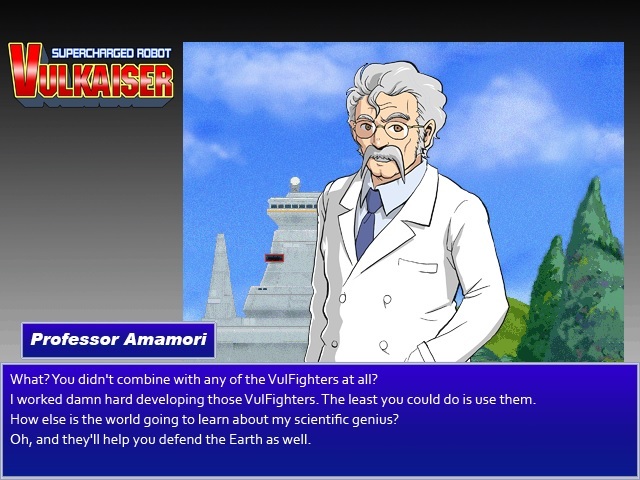 Be careful to not abuse the Vulfighters, though. Once a Vulfighter’s health bar is depleted, it is gone for the entire run of the game and cannot be used again. If you want a great challenge, try playing through the game without using a single Vulfighter. It’s a fun time. He had an ulterior motive all along! Scoring is broken down into three parts. Step 1 to scoring points is to shoot as many enemies as possible. Step 2 is defeating the boss in each level with the timer intact. Step 3 is keeping the Vulfighters alive. Doing all three successfully will increase the number of points earned in a level. At the end of each level, the Vulkaiser and any Vulfighters that managed to not be shot down will get a small repair boost to their health bars. There isn’t much to discuss in the sound department. The game has a musical score for each level. It’s nothing memorable, but it’s better than not having music at all. The sound effects are crisp and clear. Supercharged Robot VULKAISER gives players what it promises, a solid fun horizontal side-scrolling shoot ’em up. I was expecting more content in the game and was disappointed there wasn’t more modes or levels. Thankfully, the price of $4.99 reflects the content inside the game. It’s not a game that will have hundreds of hours logged into it. When I need a quick shooter to pick and play on a short time limit, Supercharged Robot VULKAISER will satisfy the need for a quick session. Previous Post:Nippon Ichi Software Teasing New Horror Game?